Venezuela’s President Nicolás Maduro is facing an international backlash after winning his second six-year term, in a landslide vote marred by an opposition boycott and claims of vote-rigging. Fourteen countries including Argentina, Brazil and Canada have recalled their ambassadors from Caracas in protest. The US has imposed new economic sanctions after Sunday’s election. Venezuela is suffering from food shortages stemming from its economic crisis and voter turnout was low. US President Donald Trump called for new elections to “end the repression” of Venezuelans. However Russian President Vladimir Putin congratulated Mr Maduro on his re-election on Monday, wishing him “success in resolving the social and economic issues facing the country” in a statement. With more than 90% of the votes counted, Mr Maduro had 5.8 million votes, or 67.7% of the total, the electoral council announced. The main opposition candidate, Henri Falcón, stood on 1.8 million votes or 21.2%. The US Vice President Mike Pence earlier denounced the election as a “sham” and “illegitimate”. The US had already slapped sanctions on Mr Maduro and his senior aides, as well as banned US companies from buying any more debt from Caracas or the state oil company. “The United States stands with democratic nations in support of the Venezuelan people and will take swift economic and diplomatic actions to support the restoration of their democracy,” US Secretary of State Mike Pompeo said in a statement. Venezuelan foreign minister Jorge Arreaza called the sanctions “madness, barbaric, and in absolute contradiction to international law”. Even before the election took place, the United States, Canada, the European Union and a dozen Latin American countries said they would not recognise the results. Now Mexico, Colombia, Chile, Panama and Peru are among those scaling back their diplomatic relations with Caracas. But as well as Russia, El Salvador, Cuba and China congratulated President Maduro on his election win. Beijing said the parties should “respect the choices made by the people of Venezuela”. Why is there a row about the turnout? The National Electoral Council (CNE) put it at just 46% but the opposition alleges it was even lower. Mr Falcón rejected the result soon after the polls closed and called for new elections. “We do not recognise this electoral process as valid… we have to have new elections in Venezuela,” he said. Due to the opposition boycott, a win by Mr Maduro had been widely expected. What observers were more interested in was to see how many Venezuelans would turn out to vote. The CNE said turnout would probably rise to 48%, still well below the figure in the 2013 presidential election, when almost 80% of eligible voters cast their ballots. The opposition, however, accused the CNE of inflating its figures and claimed the real number was closer to 30%. A source within the CNE told Reuters that only 32.3% of eligible voters had cast their ballot by 18:00 local time, when most voting stations closed. 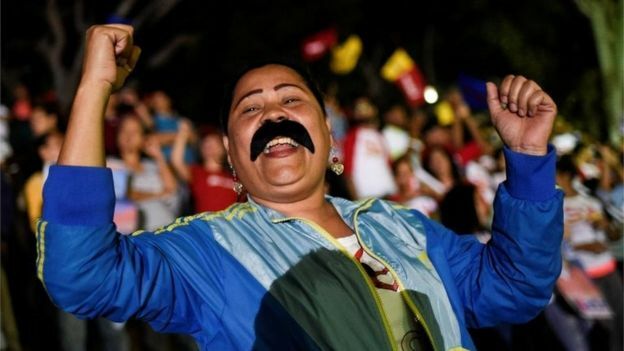 Mr Maduro and his supporters were jubilant. The 55-year-old told cheering crowds outside the presidential palace in Caracas that “the revolution is here to stay!”. His supporters chanted “let’s go, Nico!” as fireworks went off and confetti was fired in the air. He also mocked his rival, saying Mr Falcón had been left “groggy” by the knockout victory Mr Maduro had achieved. And while on the one hand he called for dialogue with the opposition, he also told supporters that “the opposition must leave us alone to govern”. Previous attempts at dialogue between the opposition and the government have failed. The main opposition coalition had warned that the election would not be free and fair. It said the poll had been brought forward from December 2018 to take advantage of disarray within opposition ranks and that some of the most promising candidates had been banned from standing or jailed, while many others had fled the country. That is why it called for a boycott. 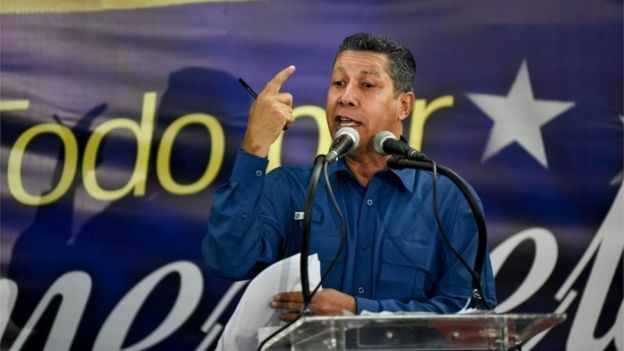 Mr Falcón however broke ranks, arguing Venezuelans should be given a chance to vote Mr Maduro out of office. How did people react in Venezuela? Such was the expectation that Nicolás Maduro would win that his rivals admitted defeat, denouncing the result before it had even been announced. There was never going to be any result other than a Maduro victory – and Venezuelans knew that. It feels like most people here are no longer outraged. Disappointed, maybe, but it’s par for the course in a country where political freedom feels increasingly limited. Mr Maduro has promised change in Venezuela – why he needed a second mandate to do that is anyone’s guess. He’s already been in the job five years. Added to that, change for the better under Mr Maduro is unlikely. With international pressure likely to build after these results, and with a crumbling economy, his job is harder than ever – as are the lives of Venezuelans. 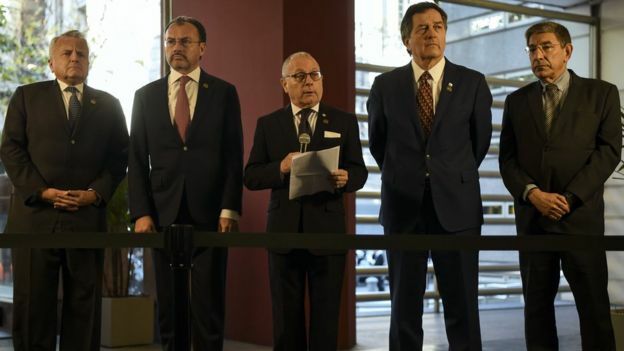 As well as the US, the European Union and Latin American countries had also warned ahead of the vote that they would take further measures against the Venezuelan government if it went ahead with the election. The exodus of Venezuelans leaving their country is expected to speed up further. According to International Office of Migration figures, the number of Venezuelans living abroad increased to an estimated 1.6 million in 2017 from 700,000 in 2015.